This Fall the fur is flying…off the runways and out of the stores. From luxury pelts to fabulous and faux, there is something furry for everyone. For this look I decided to accessorize with a new fave bag and slides, both trimmed in fun faux fur. 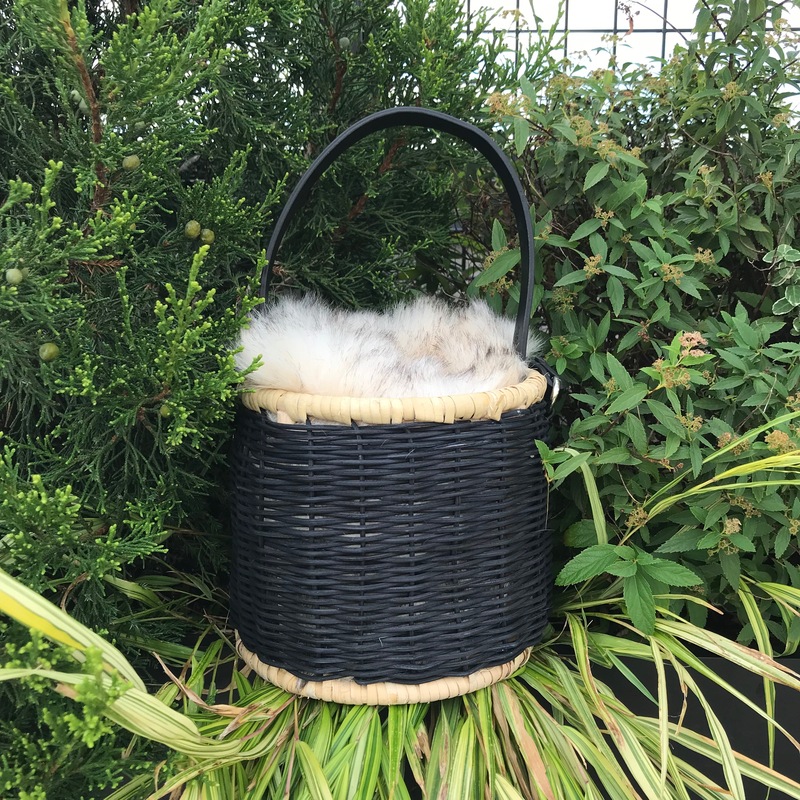 Can I just say this raffia-and-fur bag is about the cutest thing! And these slides look luxe and feel like you’re walking on pillows. I forgot all about my plantar fascitis! I kinda sorta had to beg my husband Chris to shoot this post before we hit the road for our cabin on Friday morning. So there was no time to shoot anywhere except the roof of our building, which fortunately is very photogenic. Thought a bit sunny, so hope you’ll forgive the squinty eyes. I also thought you all might get a kick out of seeing the view from up there. And just in case you spy them, yes that’s a giant chess set, and yes that’s a Bocci court I’m walking in. It’s all a lovely mix of greenery (real and faux) and urban landscape. 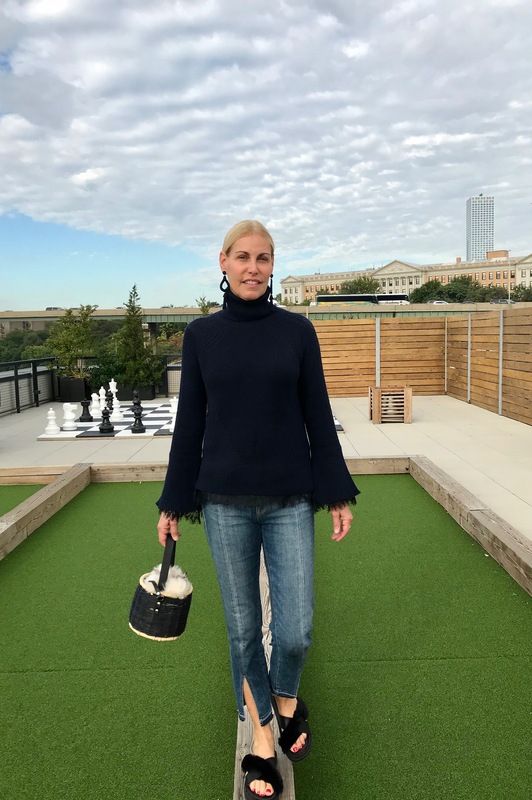 A perfect spot for this casual city chic look, which I will be wearing on heavy rotation now that Fall’s crisper air has arrived. First, this cabled turtleneck! Another stellar piece from Olivia Palermo’s capsule collection for Banana Republic. I’m obsessed with the mix of chunky wool texture and touches of lace. Love the swingy hem and bell sleeves. And the combination of navy and black is one of my favorites. 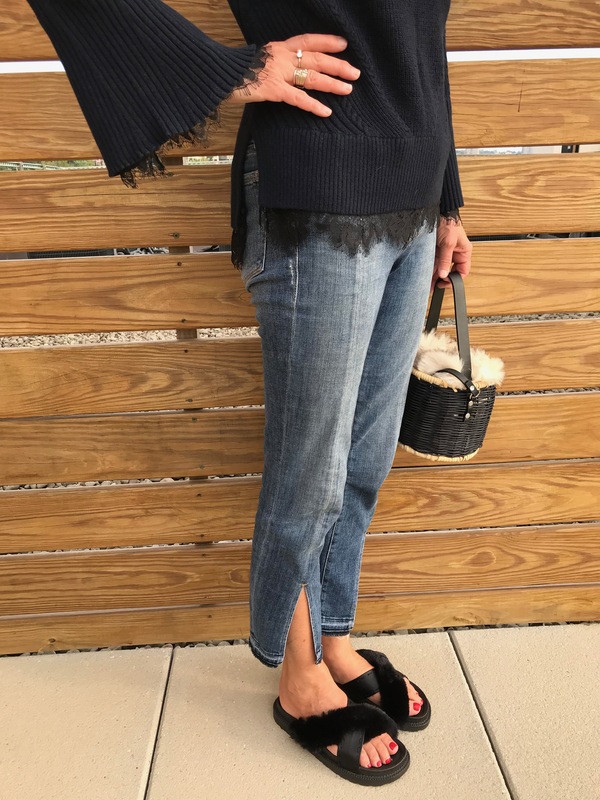 Speaking of favorites, these split-hem jeans from Frame are top of my list, too. If you don’t know Frame, you should. All of their styles are inspired by London and crafted in LA. They are a bit pricey but their quality is undeniable. Which means they will look good and fit great, wash after wash, season after season. And Frame is always at the forefront of denim trends. 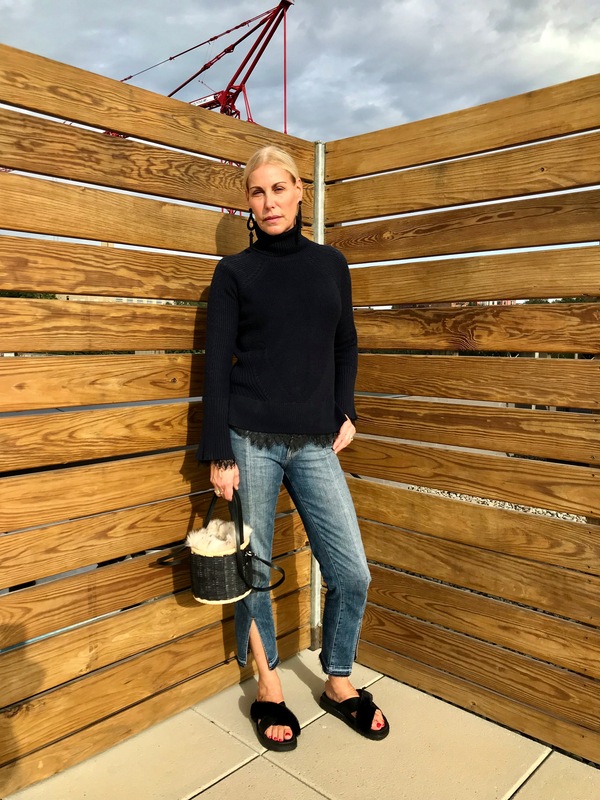 I’ve steadily been adding a pair or two each year to my jean collection, and I do happily wear them again and again. 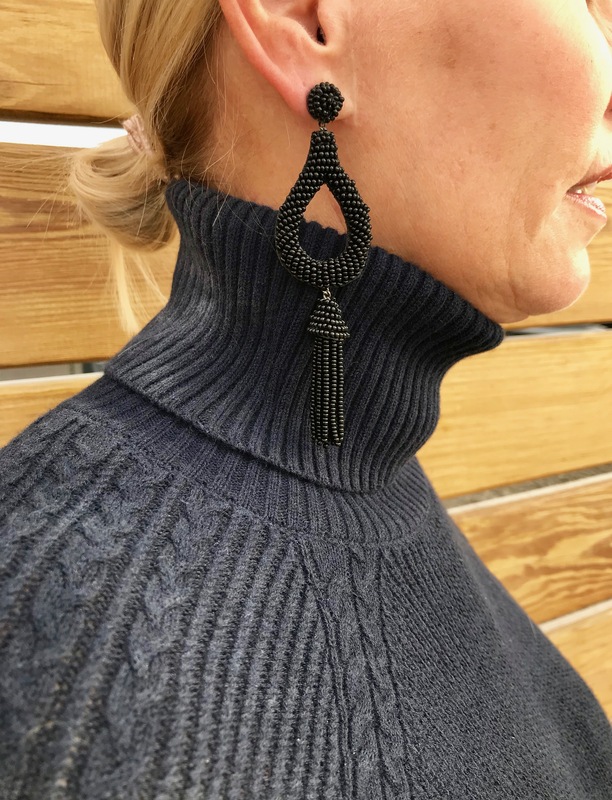 So other than my black tassel earrings and a messy chignon, that’s pretty much it for this look. Simple but chic. And when it (finally) gets colder, I can wear this same look with black booties. Or go for the ultimate fashion blogger look of socks-and-slides! Are you Falling for fur, too? I’d love to hear about your favorites! 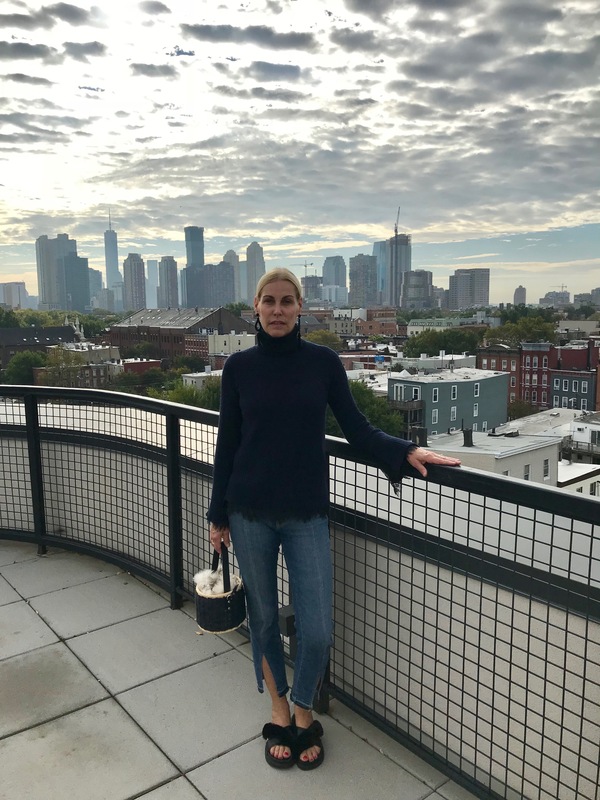 Sweater: (Banana Republic x Olivia Palermo, Fall 2017, also comes in Cream…which I might have to splurge for as well.) Like this and this, too.